Butterflies are one of most diverse and beautiful insects in the world. The large group of butterflies include more than 250000 spices. From smallest Western pygmy blue to largest Queen Alexandria’s bird wing butterflies appears in wide varieties of colors and patterns. The fascinating butterflies also indicate healthy ecosystem around us. 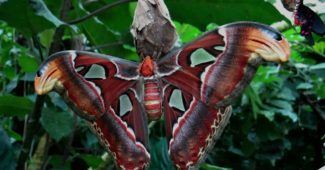 Here 10 most unusual and beautiful butterflies around the world. Blue morpho butterfly is one of the largest butterflies in the world with wingspan 5-6 inches. They are mainly found in tropical forests of South and Central America. Blue morpho butterflies are easily recognized by their vivid blue colored wings with black edges. The wings of male morpho butterflies appears more brighter and beautiful than that of females.The underpart of blue morpho’s wings are in brown color with number of eyespots. The back parts of wings also helps blue morpho to make camouflage such that they can hide from potential predators like lizards, frogs and birds. 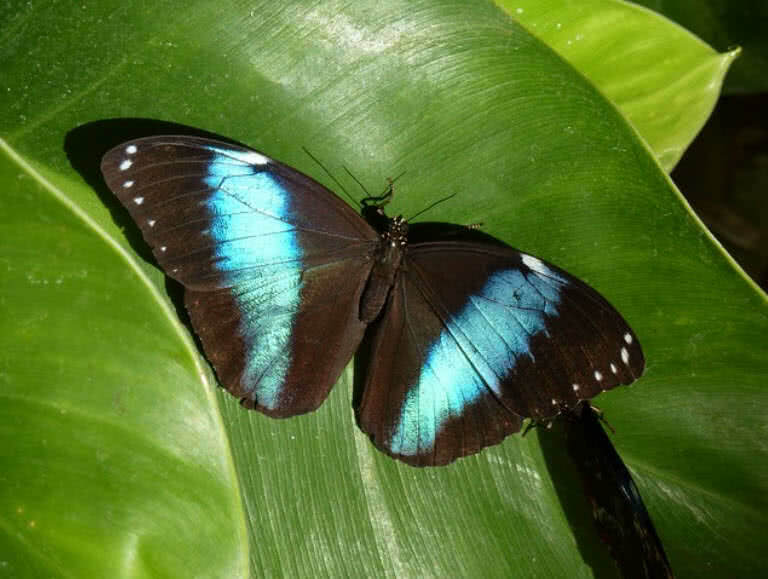 Blue morpho butterflies spent most of time in lower shrubs of tropical forests. But they become visible to all sections of the forest during mating season. The beautiful butterflies also release strong smell from their glands when they being threaten by other animals. They mainly feeds on leaves of varieties of plants, fungi and rotting fruits. 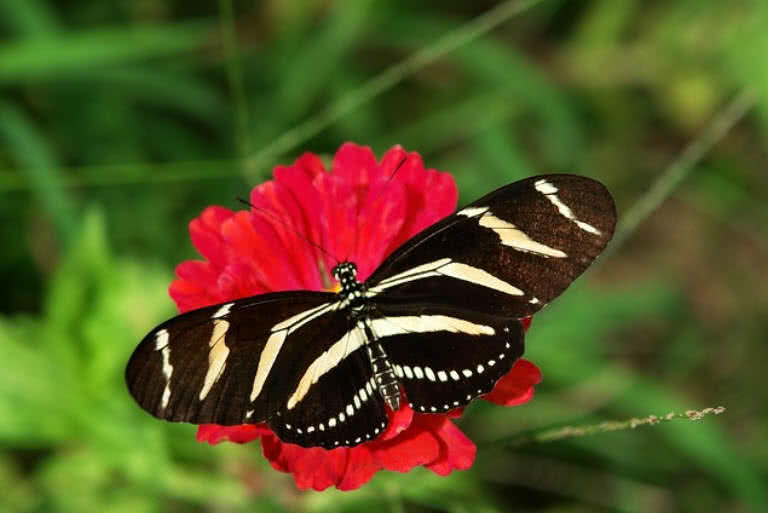 Zebra longwing butterfly is the official butterfly of Florida of United States, declared in 1996. As it’s name implies the butterfly has low narrow wings with zebra like stripes. Their wings are in black color with yellow stripes. The top and bottom part of zebra longwing’s wings have same pattern. But the color of underpart of wing is much lighter than that of upper part. The fascinating butterflies are distributed throughout South and Central America. The wingspan of zebra longwing ranges between 72 and 100 mm. Zebra longwings are the the only butterflies that like to feed on pollen. Scientists believed that nutrients from pollen help the zebra longwings to live longer (about six months) than that of other butterfly species.They also like to have leaves and nectar. Zebra longwings make creaking sound when they threatened. They stay together in group at night on tree branches. 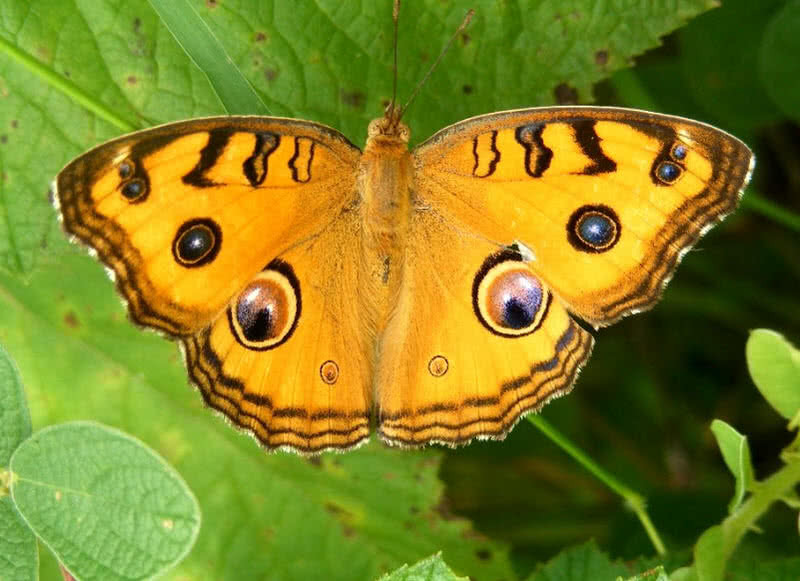 The peacock pansy butterflies are recognized by their striking eyespots. The fascinating butterflies are native to South Asian countries. The upperside of peacock fansy’s wings are yellowish brown in color with brown edges. There are also distinct costal bars and attractive ‘peacock eyespots’ on the wings. The eyespots on the lower part of the wings become more prominent and attractive. The patterns on underside peacock pansy’s wing’s changes with season. Unlike dry season more brightfull patterns and eyespots form on the wings in wet season. Compare to upperside the costal bars on the edges of underside of their wings are appears to be dull and less attractive. It takes 3 – 5 days to hatch the eggs of peacock pansy. The leaves of host plant become main food of caterpillars. It also takes another 5-6 days for development as a butterfly from pupa. The adult peacock pansy has a wingspan between 54-62 mm. They mainly prefers to live in gardens and open areas. 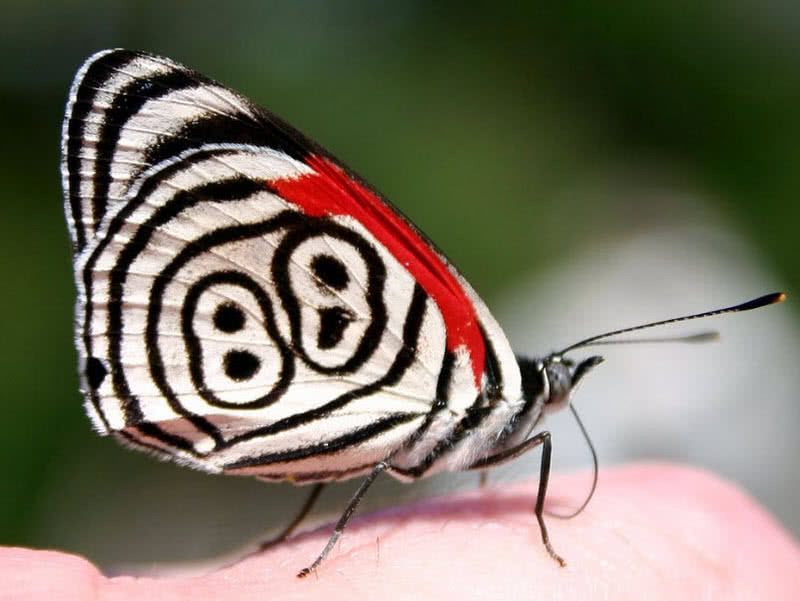 The beautiful eighty eight butterfly or diaethria clymena native to South and Central America. They are named after the black and white stripes on their underwing that outline the number ‘eighty eight’. The same numbering found in 12 different species of diaethria butterfly. But the coloring and pattern slightly differs across the species. The upperside of eighty eight butterfly’s wings are black and band of blue and green also appears on their forewings. 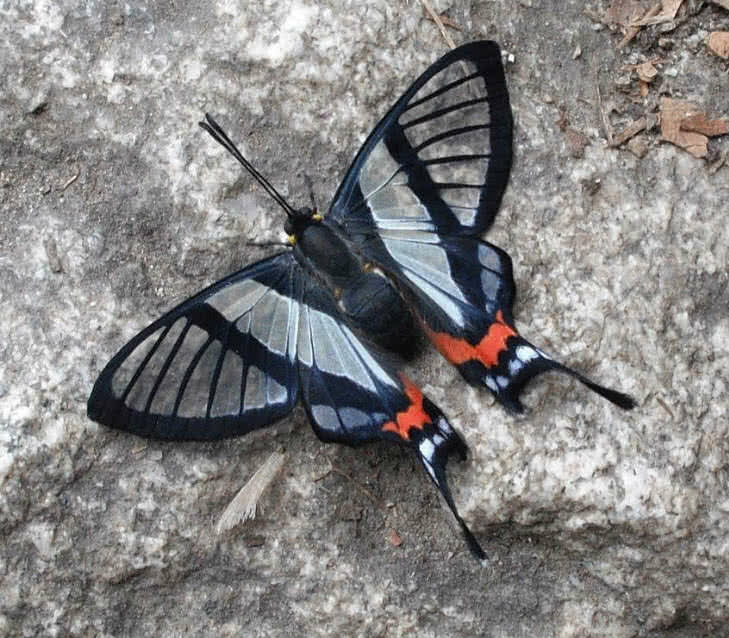 The underside of their wings have attractive black markings on white and red. The thickness and brightness of the black markings are also varies among different species of eighty eight butterfly. The eighty eight butterflies are found in small and large group in accordance with circumstances. The active butterflies are also found in human habitations. They also like to rest on rock faces and mineral rich soil. They laid the eggs on leaves of trema plants. The larvaes also feed on the leaves of the host plant. The adult eighty eight butterfly has a wingspan of 35-40 mm. Eighty eight butterflies mainly feed on rotten fruits. 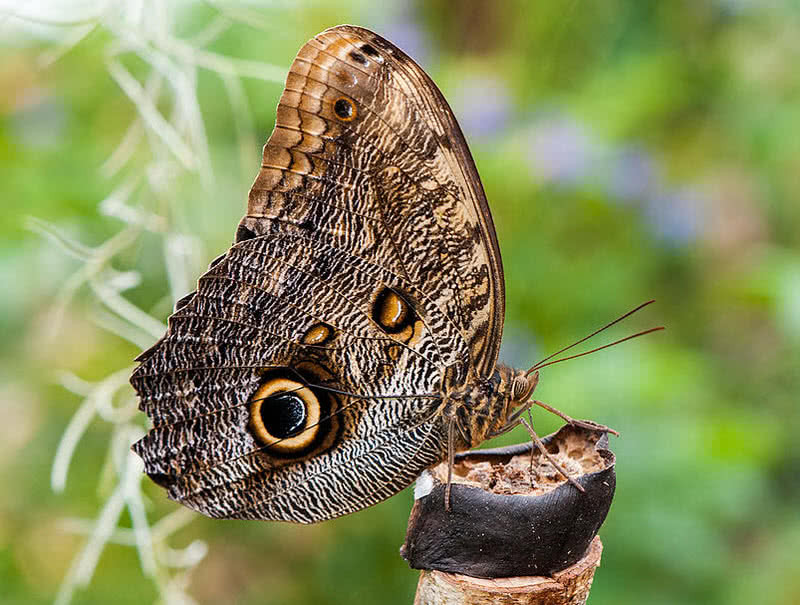 The fascinating giant owl butterflies are known for their huge own’s eyes like looking eyespots on underpart of the wings. They are a member of owl butterfly family and native to South and Central America. The large butterflies have wingspan between 13 and 16 centimeters. The huge eye pattern on their wings actually look like eyes of many predators. It help the giant own eye butterflies to escape from potential predators like lizards or frogs and to threaten other small animals. The upper wings of owl butterflies is yellowish brown in color with purple borders. The large owl butterflies are also fly a few meters in short time. They usually fly across forest or agricultural fields at evening. Owl butterflies mainly feed on fruits. They have a lifespan between 125 and 150 days. The pretty transparent winged sylphina butterflies are distributed across Peru, Ecuador and Bolivia. 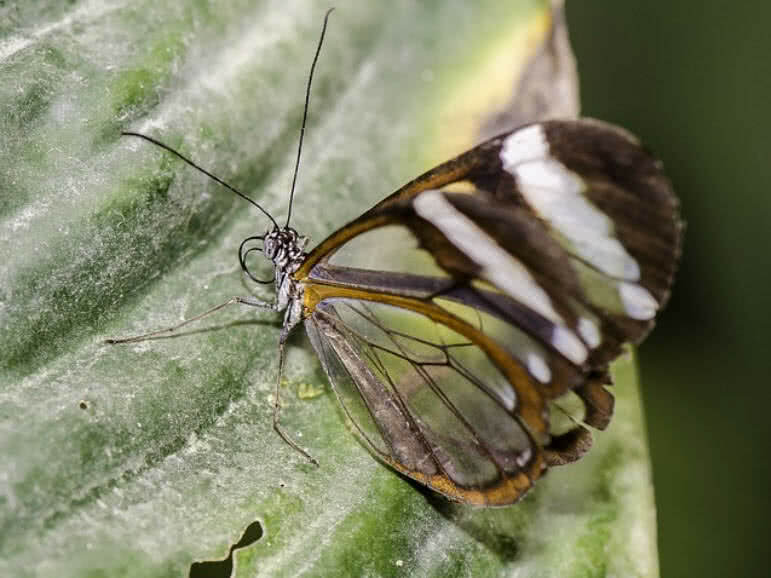 The transparent inner part of sylphina angel’s wing’s are lined by black outer wings. Their attractive tail reflect fusion of green, blue and pink hues. They spend most of time beneath the leaves of plants and only make flight during full sunlight. They used to live across clouds forest of high elevation. The sylphina angel butterflies like to fly and search for food alone. But on clear days they also found in group of tens to hundreds of butterflies beneath the leaves of plants. They also migrate to distance up to 320 km during spring season to find out nectar rich flowers. The apollo butterfly is easily recognized by it’s attractive white body with eyesposts on the wings. The forewings of apollo butterflies have number of black eyespots and hindwings are decorated also decorated with striking four red eyespots. They are found in some specific areas in Italy, Spain and France. The size and brightness of red eyespots on the wings of apollo butterflies also varies by the location they belong to. 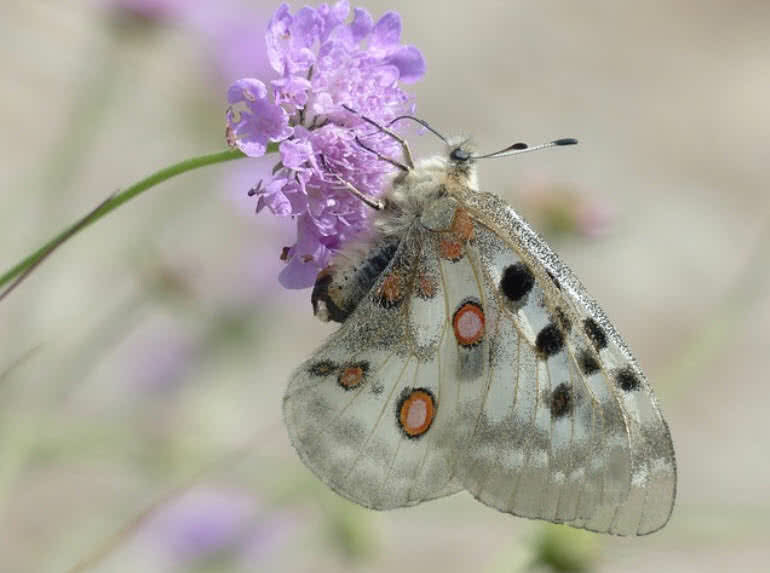 Apollo butterflies are also one of the most threatened species of butterflies in Europe. Besides beauty the apollo butterflies are known for their defensive strategy. The larvae form of apollo butterflies have deep dark color and they exhibit camouflage using the color. The adult butterflies can’t use the technique of camouflage because of their striking red eyespots. But they produce foul smell to threaten the predators. As the name indicate the butterfly has transparent wings. It is also called as greta oto and found across Mexico and Colombia. Their transparent wings make it too difficult for predators like birds and reptiles to catch them. In fact the reddish brown border on it’s wings itself make them visible but not so easy. Great oto butterflies also exhibit long distance migration to Florida. They mainly feed on common flower called lantana. The emerald swallowtail is a member of large family of swallowtail butterflies. There are 550 different species of swallowtail butterflies in the world. 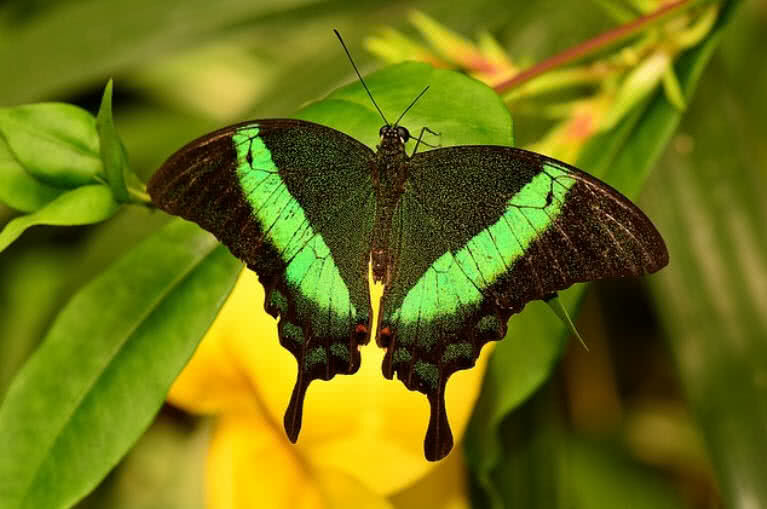 The emerald butterfly is also one of most colorful and largest butterflies in the world. The mainly found in Southeast Asia. The fascinating emerald swallowtail has wings of shining green bands. The structural coloration on their wings also make blue and yellow reflections. The underpart of emerald swallowtails wings are black and orange. A number of blue spots can also found at the edges of underside of the wings. The dead leaf butterfly is an outstanding example of amazing animal camouflage. The underpart of it’s wings are in dark and brown. The irregular patterns and veins on the wings make resemblance with dead leaf. Unlike underpart the upperpart of dead leaf butterfly’s wings appears in number of brilliant colors including blue, brown, white and orange. They also called as Indian leaf butterfly, native to tropical forest across Asia. The resemblance of their wings with dead or fallen leaf help them to easily hide from potential predators. They never fly too much or faster. They usually rest in a place for longtime from where they find food. 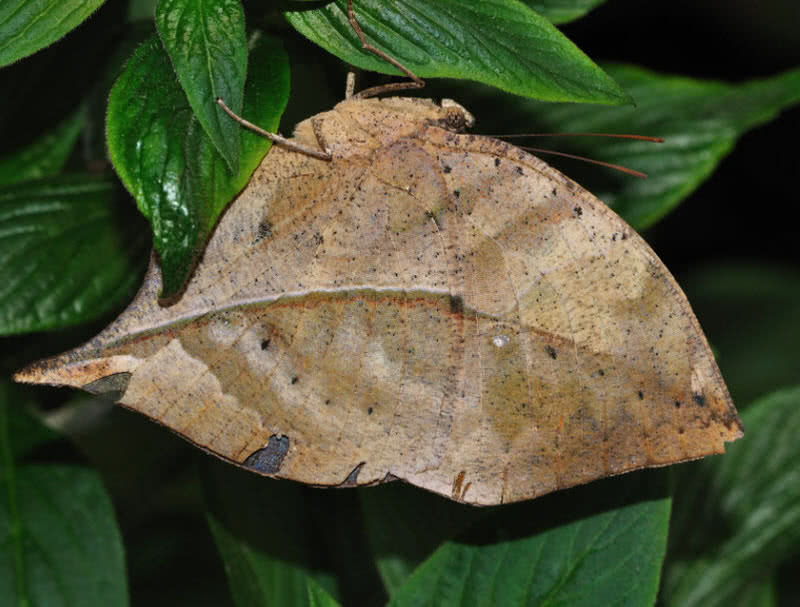 The leaf butterflies only move from the position when they threatened. The camouflage tactic itself help the dead leaf butterflies to settle in a place for long time. The nectar of flowers and fallen fruits are main items within the diet of dead leaf butterflies.